There is a morning tour and an afternoon tour leaving every day throughout the year. This is a fantastic tour for spring and autumn months when Amsterdam is not so busy and the climate is comfortable. We are comparing Amsterdam Historical Bike Tour Prices from leading ticket suppliers and Try to find you Cheap tickets prices on the market. Amsterdam is famous for having more bicycles than it does residence so if really want to understand what makes this western European city tick then you had better get yourself on two wheels! During a 3-hour tour you will have the opportunity to ride alongside the charming canals and over famous bridges as well as visiting the less touristic areas of the city. Take a break in Vondel Park, browse for treasure at the flea market, cycle past Amsterdam's top museums and pause in front of Anne Frank's House. Your experienced guide will fill you in on what you need to know and be pleased to answer your questions. Take your time to marvel at the grand 17th-century architecture and its contrast to the modern shops, bars and restaurants and delve into the narrow alleys of the infamous Red Light District. Each tour is a little different just to keep things fresh. Your guide will teach you about the city's history and be ready with some tips for restaurants and nightlife. The leisurely pace will give you plenty of time to ask any questions about the city or Holland. This tour is aimed at active visitors. Ideal for both youngsters, adults and seniors. Amsterdam is known for its flat landscape the only requirement is that participants have a moderate level of fitness and are able to ride a bicycle. Your Experience With Amsterdam Historical Bike Tour? Explore Amsterdam like the Dutch do, with two wheels and peddle power. Ride your bicycle to the heart of the historical city and learn about the original construction and development of this iconic city. Cycle through Vondel Park, Museum Platz, and the Red Light District in the company of a knowledgeable bilingual guide. Let your local resident guide take you to some of the best spots in non-touristic neighbourhoods of the city. What Amsterdam Historical Bike Tour Includes? Travelers Reviews about Amsterdam Historical Bike Tour? Get Your Guide users have awarded this 3-hour bike tour many 4 and 5-star reviews, the tour has an average rating of 4.7 out of 5. 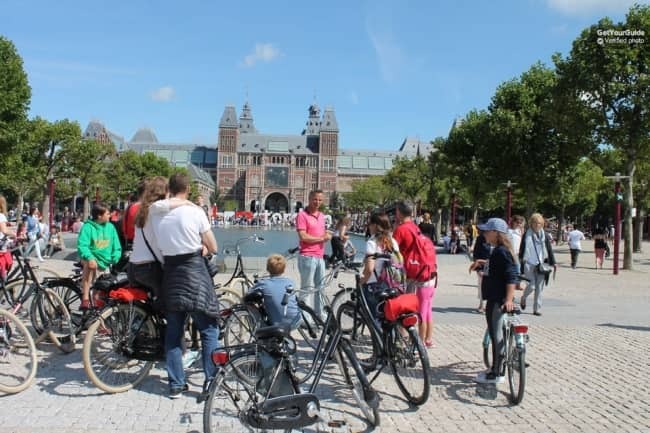 On both TripAdvisor and Viator the Amsterdam bike tour has a perfect 5 out of 5-star rating from happy travellers. Participants have said that the tour is very fun and that guides are both laid back and informative. Reviews point out that the tour guides will carry out the tour even in the case that some participants do not turn up. You must bring either a printed or electronic ticket. Cancellation fees can apply if tour is cancelled within 7 days of departure date. Food and drinks are not included in the ticket price. This is not a strenuous cycle route, it is suitable for all. Please check dates and times for tours in languages other than English. Meeting Point: Piet Heinkade 25. 1019 BR Amsterdam.